“Phish Head” and “pothead” have practically become syllogistically synonymous terms, and the NYPD knows it. 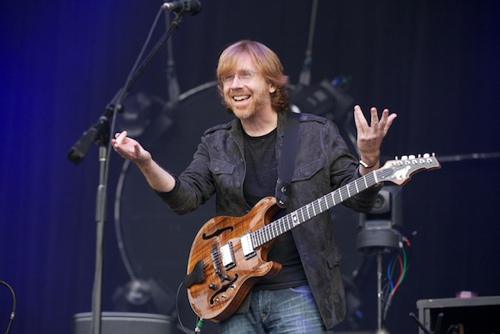 That’s why when Trey Anastasio and his merry jam band of revelers took up their annual New Year’s Eve residency at Madison Square Garden, the police made sure to increase their presence around the venue. The result was at least 228 arrests over the first three nights of Phish’s stand, reports The New York Times. Some of the arrests were attributed to public urination and ticket scalping, but the majority of the cuffings came from possession or sale of drugs. According to the Times, those drugs included marijuana, hash, psychedelic mushrooms, LSD, MDMA (Molly), ecstasy, Oxycodone, OxyContin, and Xanax. Most of the charges were misdemeanors or summonses, though at least 10 individuals received felony charges after attempting to sell drugs to plainclothes officers. While Phish shows have a history of leading to numerous drug arrests (hell, there were prostitution charges filed at the band’s Halloween shows in Atlantic City), the huge number during these NYC gigs does stand out. However, given that one of 2013’s most talked about news stories was the early cancelation of Electric Zoo in September following two MDMA-related deaths, the increased police presence isn’t exactly astonishing. Still, some Phish Heads worry their predilection for a certain band leads to their being unjustly targeted. In other news, the only problem facing Colorado concertgoers the next time Phish comes through should be the price of their high.